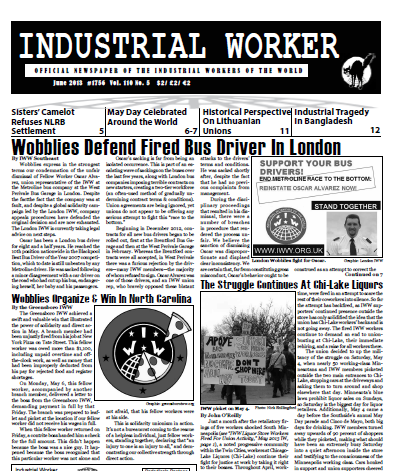 Articles from the June 2013 issue of the Industrial Worker, the newspaper of the revolutionary union, the Industrial Workers of the World (IWW). A response by Arthur Miller to “Staughton Lynd Responds To Counterpoint On Planks”, which appeared in the April 2013 Industrial Worker. I do not misunderstand Staughton Lynd, I just have a different point of view. If our Preamble only spoke of industrial unionism I could understand his point of view, but it includes much more. Yes, the United Mine Workers (UMW), as is most all industrial unions in the AFL-CIO, is a far too top-down organization. That is not the fault of industrial unionism, but rather the fault of top-down unionism, of which the trade unions are mostly the same. Still, even there I would say having industrial unions is far better than trade unions. I know this firsthand because since 1972, for the most part, I have belonged to other unions besides the IWW. Most of them were trade unions. In construction trade unions, they have been forced to create a bit of a hybrid form of industrial unionism between the Building Trades and Metal Trades Councils. But even with that, the trade union side of thinking sometimes wins out. I experienced that two times. Once during a Metal Trades strike that lasted eight-and-a-half months, when one of the unions signed their own contract and crossed the picket line of the other unions. Another time one union, the Boilermakers, signed a contract that left the other workers locked out for over a year. Think about how things would have been if mining, auto, steel and so on organized by trade rather than by industry. You think things are bad now, it would be far worse if that had not happened. My point is that industrial unionism needs to be our union structure, but it does not stop there. There are many other things that are needed for good revolutionary unionism. It is true, in my view, that “conventional labor unions would not seek radical structural change.” That is why we workers need the IWW and its unconventional revolutionary industrial unionism. As a long time dual carder it has been my view for over 40 years that the AFL-CIO cannot be reformed. Yes, in modern times the IWW has been a bit weak at explaining its practices and ideas. Heck, all but one of our official literature items is out of print. And that is a big problem because I believe that we don’t only organize bargaining units, we also need to create Wobblies. As to the term “to organize,” I think we have a different view on that. I believe that the role of organizers, that is good organizers, is to organize themselves out of a job. 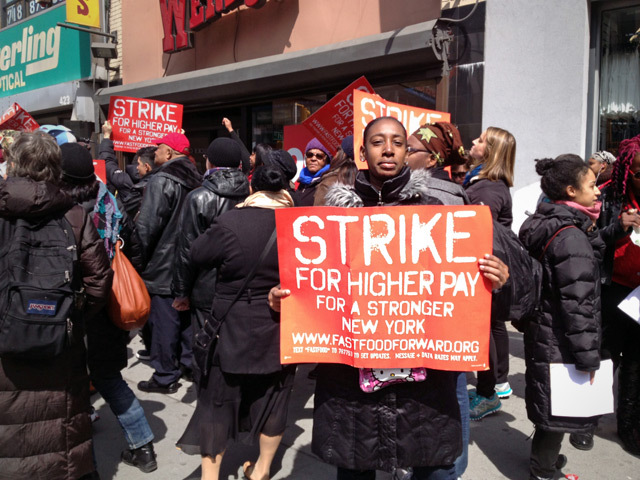 In other words, their job is to organize the workers so that they, the workers of a shop, can take over all the union work of their shop and branch when they are able to. The idea that workers should only organize themselves and once they do that we are willing to accompany them will not work often in the real world and would put off the workers taking control of their labor forever.